When it comes time to make an investment into your athletics program with a scoreboard upgrade, you’re looking for a solution that will make a great impact now and in the future. Like every athletic director, you’re probably taking into consideration what your new scoreboards will be like today and also in five to ten years. We gathered some experts in software, hardware, and design to talk a little bit about why a ScoreVision system is an excellent investment in your program now and for the future. In addition to our dedication to powerful, intuitive software, we also take pride in the hardware that runs our system. “As a technology company, ScoreVision is always looking to stay on the cutting edge of technology in terms of hardware and software. We pursue the newest and best technology on the market for our customers in order to ensure the experience delivered to fans all over the country is the best on the market year after year,” explains Jake Chapman, Vice President of Operations. One of the most unique aspects of ScoreVision is our commitment to making our powerful, robust system look modern and beautiful. From our software and apps to the appearance of our jumbotrons, it’s easy to tell the difference between a ScoreVision system and a competitive setup. In addition to graphics and video content, every sport-specific scoreboard and media layout come pre-built into every system so you don’t have to spend precious time building informative, optimized layouts. With ScoreVision’s event production software, it’s as simple as selecting the media you want to display, choosing the layout you want, and pressing play. Our system handles the rest! Whether schools choose to develop their own creative content or work with ScoreVision’s Professional Creative Services team, updating graphics and video content is incredibly easy to do. 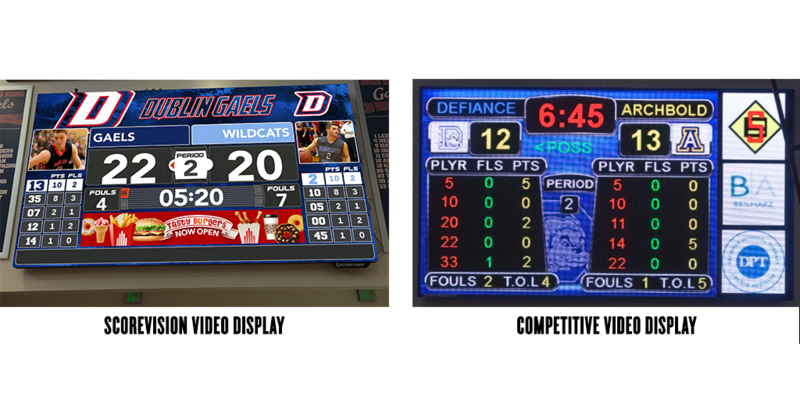 “The beauty of our user-friendly system is that we’ve made it very simple for staff and even students to get involved in the creation of the graphics and video content for their ScoreVision displays. Content can be created in common, industry-standard formats and easily uploaded to ScoreVision Central for use at games and events,” adds Sutter. If you’re ready to make an upgrade to your athletics program that will have a lasting impact for many years to come, learn more about ScoreVision, hear what our customers have to say, and contact us today!